Apprehensive Films Blog, The Ultimate Cult, Horror, Indie and Grindhouse Label: Why Lie? I Need a Drink DVD Pre-Order!!! It's true! Why Lie? 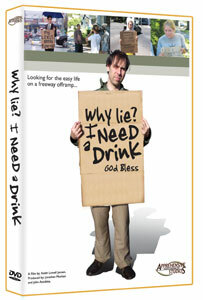 I Need a Drink, our documentary on panhandling, starring comedian Keith Lowell Jensen is finally coming to DVD on 11-16-10! The DVD is already up for pre-order on http://www.amazon.com/, http://www.barnesandnoble.com/ and others, but you can save $5.00 if you pre-order directly through us at http://www.thegrindhouse.net/ The retail price is $14.95 and we're pre-selling it for just $9.95. We've all heard the urban legend of the panhandler hopping in his nice car and making his way to a comfortable home after a day of begging on the freeway off-ramp. Comedian Keith Lowell Jensen decided to find out just how hard it really is to make money holding up a cardboard sign. With his sights set on the easy life Jensen spent countless hours employing every gimmick imaginable in an attempt to make his fortune. Trying everything from panhandling dressed like a giant banana, as a mime, a regular homeless person and even Uncle Sam, Jensen tried every trick in the book. Can you really make a good living begging? Is anyone doing it? Find out when you watch this enlightening, poignant and hilarious new documentary from Apprehensive Films. This documentary doesn't just cover Jensen s own personal trials trying to make it on the streets, but interviews real panhandlers, homeless people, the police and even your average citizen. Find out first hand what it s like to beg for money to make a day's wage. See what average panhandlers have to deal with on a day to day basis. Learn how people deal with the realities of living off of someone else's change and see where the money goes.